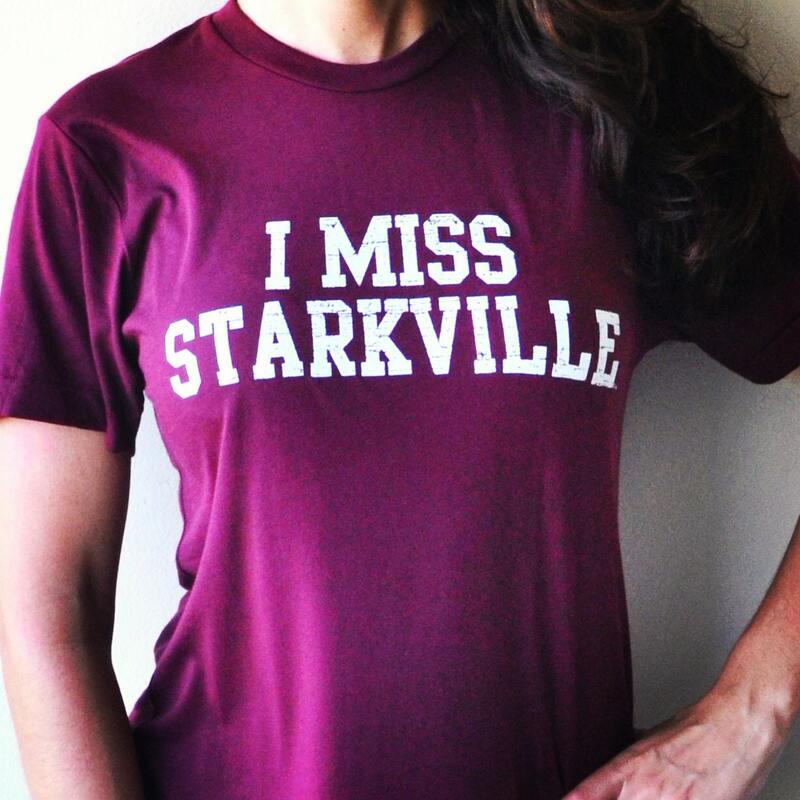 Remember the glory days with I MISS MY COLLEGE tees - the perfect gameday t-shirt that pays homage to the iconic college towns across this country; the towns and cities that shaped our young & innocent hearts and made us the tailgating superstars we are today! I MISS MY COLLEGE uses American Apparel tees. We find they are the most durable, super soft, and light as a feather. 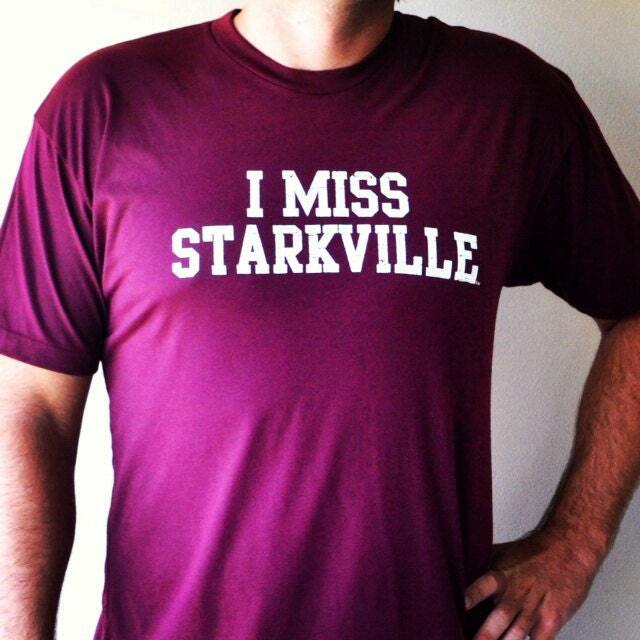 I MISS STARKVILLE tee is 50/50 blend, unisex maroon with white distressed lettering. Don't be alarmed by unisex sizing, for most people ordering the size you would normally order will serve you well...just expect to look more amazing in our shirts than in a ho-hum beefy T.
I MISS MY COLLEGE ships with USPS flat rate Priority Shipping. *Buying multiple shirts to be shipped to the same address? We can try to pack as many shirts in one box, as humanly possible. *Buying multiple shirts to be shipped to different locations? 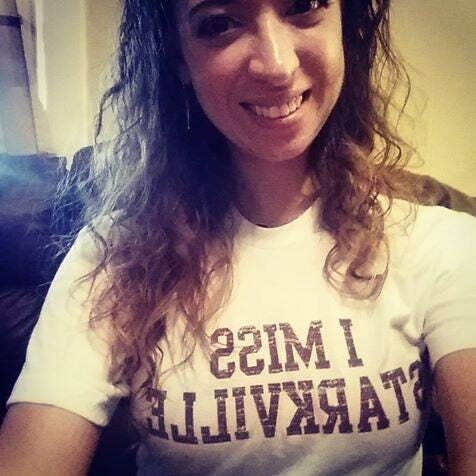 Contact us at IMISSMYCOLLEGE [!at] GMAIL.COM and let us know which shirt goes to what address. We will do our best to accommodate your requests. NO REFUNDS - RETURNS, MAYBE. I MISS MY COLLEGE only accepts returns in order to change sizes. We do not issue refunds. 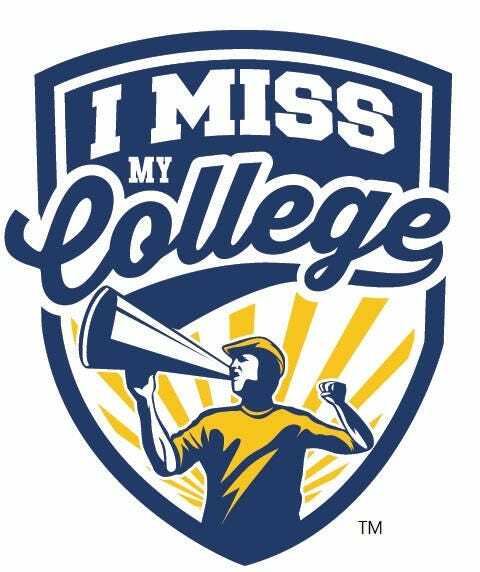 Interested in selling I MISS MY COLLEGE tees in your store or on your website? Are you a loyal alumni chapter wanting to sell I MISS MY COLLEGE tees for fundraising efforts? I MISS MY COLLEGE and each individual college town t-shirt design/slogan are officially trademarked! We opened our e-doors in March of 2012, and hold ourselves out as officially doing business in all 50 states based on that date. While some say copying is a sincere form a flattery...we aren't that all impressed by it. We encourage you to just spend the $30.50 on a shirt, and not $3,000+ on lawyer's fees on a trademark violation. It really is a win-win situation. Thanks. I MISS MY COLLEGE tees are not licensed or endorsed by any institution or organization. But then again why would they be? I MISS MY COLLEGE tees celebrate the collegetown you spent the best 4 years of your life in; the streets, the parks, the watering holes! Our sole purpose is to enable you to proudly display your passion for your collegetown U.S.A.
Love it, shipped to a friend for me! Great service! Love this shirt! It's soo soft. I didn't realize the letters had a sort of "distressed" look until it arrived, but that was okay. They still looked good. Great communication, love my shirt!